Red Hat and Hystax help companies to take a right step to a successful cloud migration journey, that paves the way for innovations, high level of data performance and security. Red Hat, the world’s leading developer and supplier of open source software, and Hystax, a provider of cloud migration and Disaster Recovery software and services, supports partner program, offering products and services, that allows companies to achieve digital transformation objectives in the fast-growing market for cloud computing. Red Hat and Hystax, building a comprehensive approach of cloud migration and Disaster Recovery process, allows companies to focus on core business, improving security and reliability of their workloads, cutting their costs for migration process. 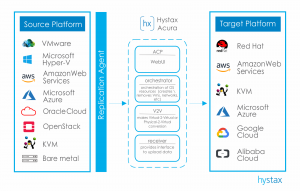 Hystax Acura Live Migration provides businesses with a simple, efficient, fully automated live migration of complex business applications from any source to any target cloud platform, helping companies to reduce TCO.